Hi girls, hope you're all good. My little fingers couldn't have moved quicker to say 'me me me, I'll do one' when Meg said that she was looking for guest posts while she's away in Oz (lucky girl!) - She's one of my all time favourite bloggers so for me to post on here is a privilege! 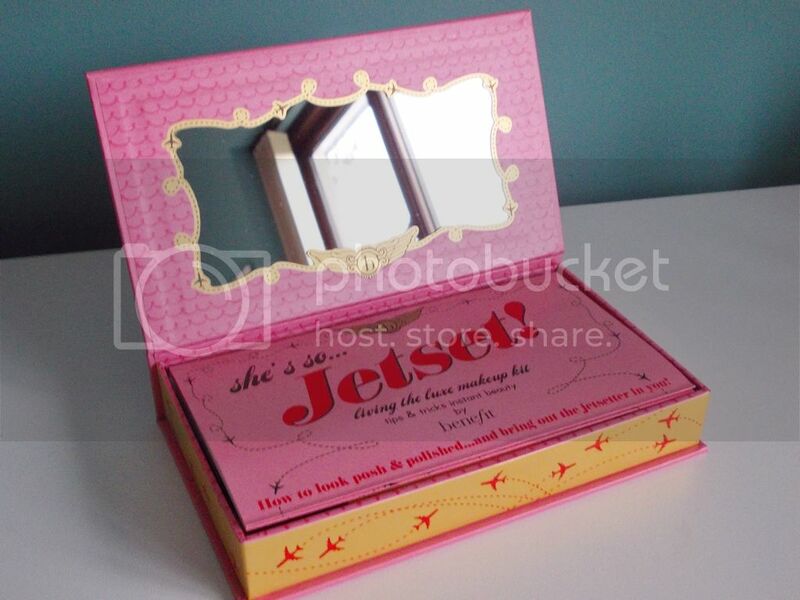 Now enough gushing about this beautiful lady and onto the post; Today I'm bringing you a little feature on one of Benefit's gift sets: 'She's So Jetset' - Living the luxe makeup kit, tips & tricks to instant beauty. 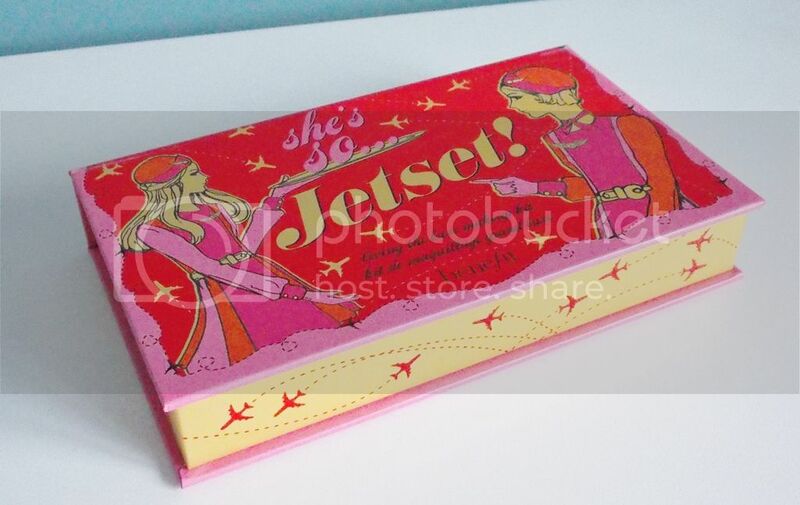 Described as 'first class beautification in a box', She's So Jetset is a five piece make up set with all the necessary bits and pieces to bring out the jetsetter in you, including deluxe sample sizes of primer, powder, eyeshadow, lip gloss and mascara, along with a powder brush and a double ended shadow brush. It retails at £29.50 full price which is quite high, but if you have this kit then there's not much else that you need and the quality of Benefit products is near faultless! Primer: The POREfessional Pro Balm - This is my number one favourite Benefit product and I have a little stash of these minis which I hope not to run out of any time soon because the full size is prrrricey! Often named 'the best' primer in existance, this silk balm glides over the skin, covering pores and leaving a flawless finish on the skin. Powder: First Class Face Powder - Exclusive to the 'She's So Jetset' gift set, this is a highlighter and blush in one that when swirled around the cheeks gives a natural flush of colour and radiance in one. Eyeshadow: Four Piece Eyeshadow Palette (Champagne Please!, Gold Card, Pretty in Mink, Elegant Espresso) - These four neutral shades are perfect for creating either a day time and a night time look with beautiful shimmer highlight and contour shades, and the inbetween shades! Mascara: They're Real! Mascara - Benefit's best selling mascara and a favourite amongst many, many bloggers. This mascara is supposed to length, curl, volumise, lift and separate lashes for a dramatic and luxurious look. The exlusive brush head is designed up pick up even the tiniest of lashes to give full definition and clump-free lashes. Lipgloss: Life On The A List - I wouldn't put myself down as a lipgloss fan, but I'm a fan of this little baby! This is a sheer and soft pink gloss which can be worn alone or ontop of a lipstick but it really helps to plump up the lips and give them a dazzling shine without being sticky or gloopy. 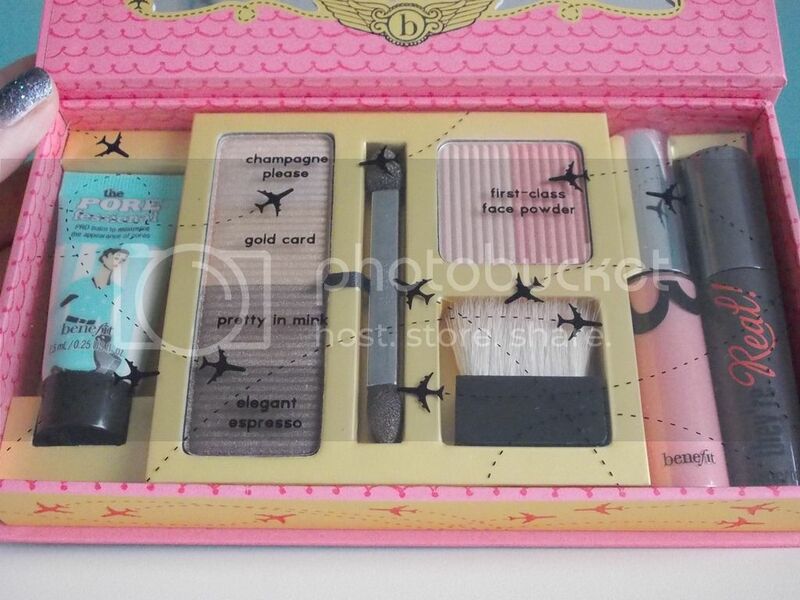 This kit is typical Benefit style with adorable packaging and a quirky name, it's perfect travel sized and won't take up too much room within your make-up collection. This would make the perfect gift to any Benefit or general make-up lover in your life, or maybe you want to give yourself a little post-Christmas treat to try out some mini versions of much hyped products to see what you think before investing in the full size. Over on my own blog I have done a post about another one of these adorable little gift sets if anybody is interested in reading: 'How To Look The Best At Everything' (link). I hope you've enjoyed this post - thank you reading and thank you Megan for having me!